Is walking two dogs the same as walking one dog? Going on a walk with one dog is a companionable affair. Just the one dog to consider. Just the one relationship. Just one speed. Add another and you have your attention split between two dogs. And the two dogs’ attention is split between you and each other. They will interact and react together. So immediately you have some unpredictability in the mix. And there’s great scope for the leads to tangle and for the dogs use you as a maypole. Add to this the fact that you’ll need to set a pace to suit both dogs - not so easy with one old’un and one young’un. Or a big dog and a small dog. Perhaps you have one surging ahead and the other lagging behind. You have to pick up poo with what - your third hand? - while you try to stop the dogs stepping in it. You have to decide which hand is holding which lead. You have to work out which lead is attached to which dog. And where do you put your treats? And if one of your dogs is reactive to other dogs, then you are setting up a learning laboratory for your second dog. Monkey see, monkey do. Reactivity is highly catching. And it may result in a “redirected bite” when the frustrated dog lashes out at the first thing that gets in the way - the other dog? your leg? Remember that if you’re introducing a new puppy into the household along with your reactive dog you also need to be following a lot of other guidelines that you’ll find in this post. So it’s not as simple as just grabbing the leads and going! You have to put some thought into this. But a little simple planning goes a long way. The first essential is to work with one dog at a time. If your loose lead walking with one dog is not stellar, there’s no chance of it suddenly improving when you add another dog. Following a step-by-step program like the one you’ll find in Let’s Go! Enjoy Companionable Walks with your Brilliant Family Dog will quickly give you skills with your lead that you didn’t know existed (there’s an art to good lead-handling), and a relationship with your dog that you may have only dreamed of. So get that going first, with each dog. You can’t expect them to learn from each other! Well … they may learn from each other, but they may learn some things you’d rather they didn’t. And once they’ve learnt those things, it’s hard to unlearn them (though it can be done, of course). And while you’re doing all these solo walks you’re building a huge relationship with both dogs. If you build a relationship with your first dog, then toss another dog into the mix you’re never going to give that new dog the chance to interact with you individually on a walk. Once you have got each dog knowing exactly where he should be when on a loose lead, you’re ready to put them together. I colour-code my dogs, so I know exactly which lead is connected to which dog at any time. This really does make life easier, so look at changing your dog-gear - at least the leads - so you can do this. Want to be able to loose lead walk your dog kindly and without frustration? Daily training videos will get you there! You also need to establish which side you want each dog, so they don’t criss-cross in front of you, tripping you and each other up. 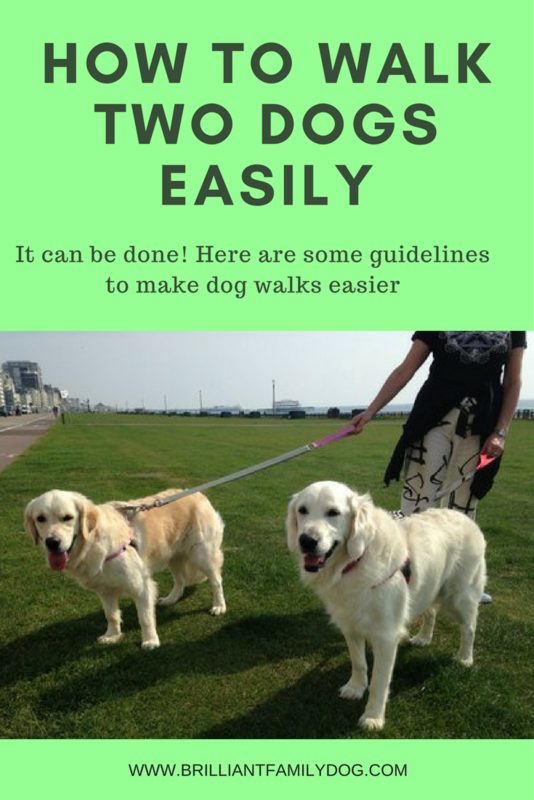 Even if you’ve taught each dog to walk on, say, your left side in solo walks, once they have grasped the principles of keeping the lead loose and staying beside you it’s very easy to flip one to the other side so you have one on each side. Of course, you may prefer both on the same side, but this can lead to jostling and differences of opinion about whose nose should be an inch ahead of the other’s! Then again some people like their multi-dogs to be out in front of them, like deerhounds. This is fine as long as there’s no tension on the lead. This can be a useful strategy if walking through crowds or narrow streets. Your focus when on these early walks - well, any walks really - is on helping the dogs to keep the position you have taught them individually. Using gentle hands on your drooping leads you’ll be able to connect with them without the need to yank or pull at the lead. Frequent rewards given to the dog who’s getting it right will quickly focus your other dog’s attention on how he can get this bounty too. A little competition can go a long way! While there is no time when my dogs cannot earn a reward for doing something I like, when I have four in hand they may have to be content with a smile and a word of encouragement each time they check in with me. Delving in the pocket for treats with four leads to hold is not so quick! What should my dogs wear? There are lots of gadgets about for stopping dogs pulling. Many of these are aversive - they work by hurting. And also many of them promise a quick fix. None of them, however kind, is a substitute for teaching your dog where you want him to be when walking! So slapping on a headcollar without any prior desensitisation is likely to end up with a dog who is forever yanking the lead while he tries to scrabble the offending object off his nose. You can certainly use a non-tightening headcollar - if your dogs have been acclimatised to it first - and it can give you that extra bit of control you may need in extreme circumstances: e.g. walking four dogs across a showground full of excited dogs and activities. The headcollar also comes into its own to help with a reactive dog who has a tendency to lunge out at passers-by. But I would not see it as an aid to get loose lead walking, and the lead would never be tight so that the dog is forced to pull into it. So by all means enjoy walking your two or more dogs together! But be sure they know exactly what you want before you start, and remember to walk them individually too on a regular basis, to reinforce that bond that develops between you and your dog, one-on-one. * This is me. If you’re from UK or Europe and you buy from me I will benefit - but you won’t pay any more!